Estampe sells stock designed early bird envelopes, or we can help you design a custom key drop-off envelope to match your car dealer's specific requirements. Allowing for 24/7 customer service, night drop envelopes are a real money maker for any car dealer, motorcycle dealership, RV dealership, tire dealership, motorsport dealership or repair body shop. 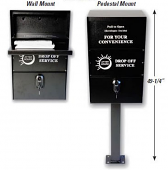 Our night drop envelopes, some times called early bird envelopes or drop-off envelopes, come pre-printed with complete and easy to understand instructions for your auto service customer. These night drop envelopes include all customer information in a clear format. Early bird envelopes are great for increasing service sales through “suggestive selling" because each is printed with a checklist menu of the most often needed service repairs. This checklist menu on the drop-off envelope reminds and encourages the customer to consider requesting additional maintenance and repairs that may have otherwise not occurred to them. These night drop envelopes include mechanic's lien information and labor authorization to insure a complete understanding between you and your customer. Early bird envelopes gather information that includes an estimate, who the estimate was confirmed to, time the service customer will call for their car, and whether the customer wants their old parts returned, labor rates, diagnostic fees and more. Estampe offers genuine online savings for early bird/night drop-off service envelopes.